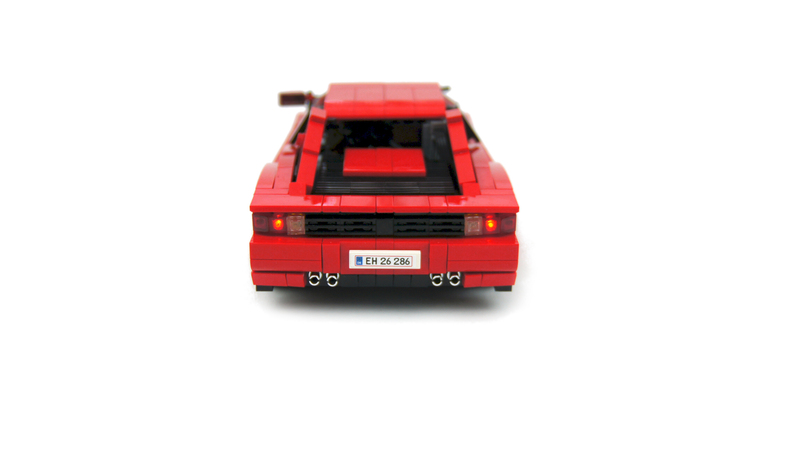 Very small model of the original 1984 Ferrari Testarossa. Features drive, steering system utilizing virtual pivots, and lights. Update: instructions for the steering system now available. 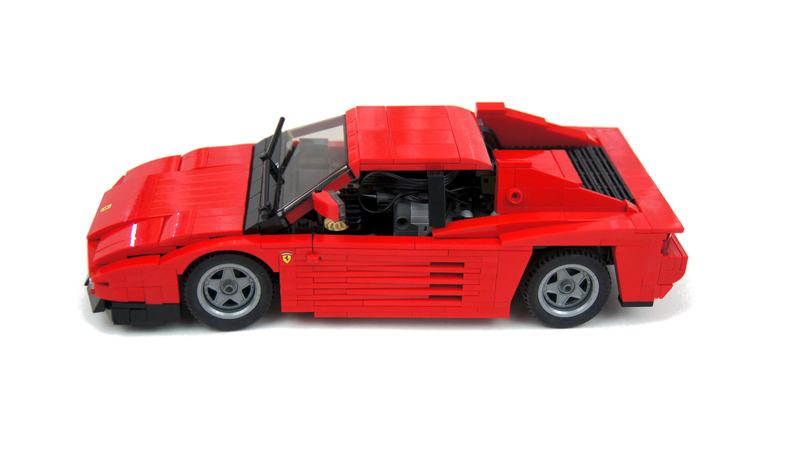 This extremely simple, small and ugly model was built as a result of Lego releasing the 10248 Ferrari F40 set. There has been much talk about making this set RC, which given its small size required rebuilding the entire chassis from a scratch in my opinion. 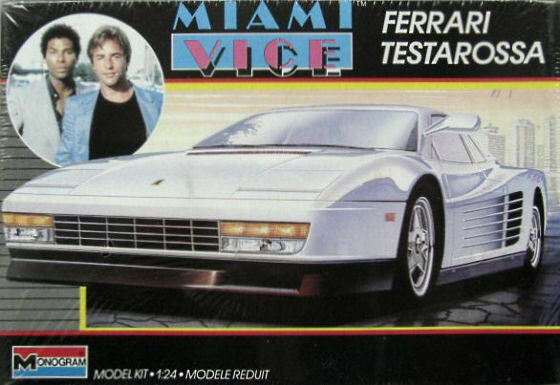 So, after some consideration I decided that rather than use the F40 to build another F40 I would use parts from this set to build the only Ferrari that really mattered in the 80’s: the classic 1984 Testarossa, made timeless by the equally classic Miami Vice TV series. 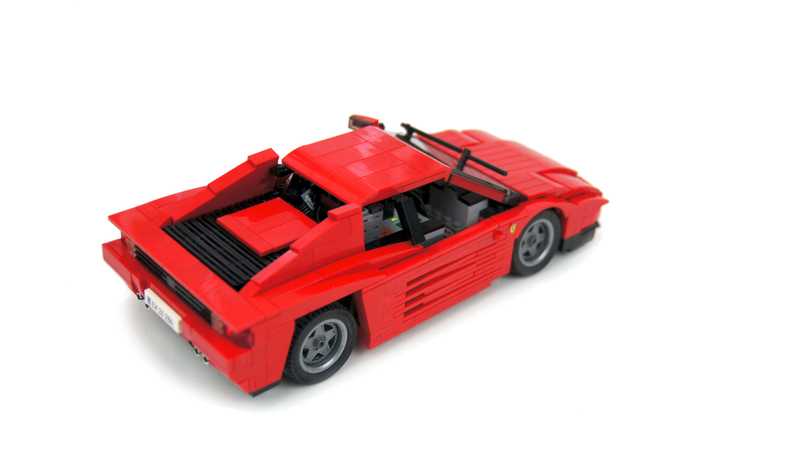 The primary reason to build this car were F40’s unique wheel covers that only appeared on few Ferrari models in early 80’s, Testarossa included. 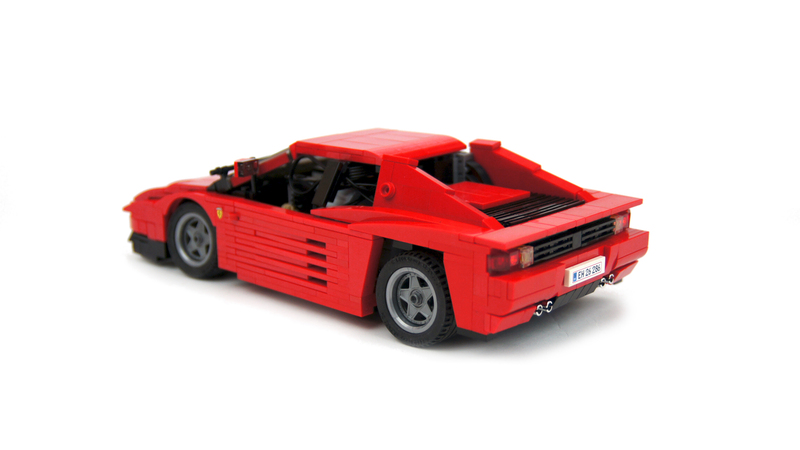 They were the reason I decided to scale the Testarossa down to these wheels, resulting in a model actually even smaller than the original F40 set. I wanted to see if I can make a car this small fully RC, and if I can make a steering system that will work with F40’s very tight front wheel arches. In the end I have succeeded on both accounts, but at the cost of the model looking very, very bad. On the technical side, the model was built around one central module filling the space between rear axle and front windshield, which combined the PF 8448 battery, a PF L motor and a PF Servo motor. The battery alone took almost half of the cabin and was the reason why the roof was too tall and disconnected from C-pillars. The PF L motor was driving the rear differential using 1:3 gearing, with the gear wheels located behind the rear axle to save some room. The PF Servo motor was controlling a push rod that would activate a complex linkage making the front wheel steer with virtual pivots. It was not a perfect steering system, it had plenty of backlash, weird geometry, it made it difficult for the Servo motor to return to center and it made driving perfectly straight difficult, but it achieved its primary goal: it made the front wheels fit under the wheel arches, sometimes literally a hair’s breadth away. The look of the model was completely wrong, from the hood that was too tall because of the steering system, to the roof that had to cover the battery. I completely hated the look of this car, even though a number of complex building techniques went into creating it. These included, among others, interlocked tiles on hinges on the sides, as well as creating a body that was 14 studs wide in front and 15 studs wide in the back. In the end it was clear that at this scale, with mechanical and electrical components filling the interior so completely, I simply could not do the original car the justice. 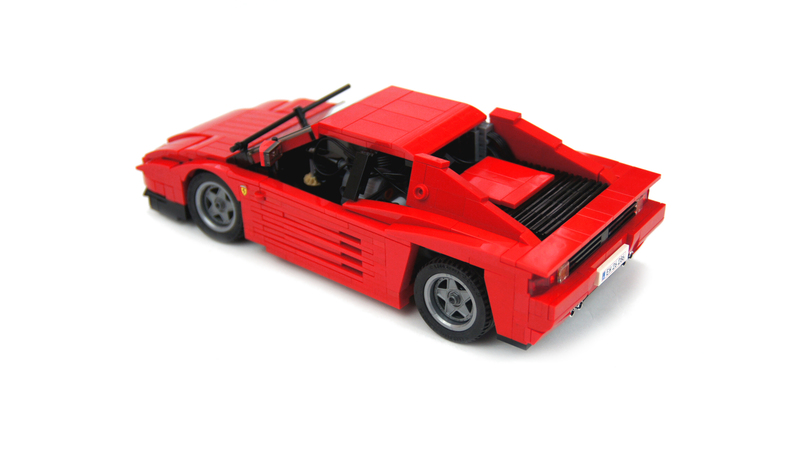 The only thing I liked was the single side view mirror, unique for the original 1984 Testarossa. Rumor has it that this single, oddly highly-placed side mirror was a result of updates to safety regulations that confused Ferrari engineers. 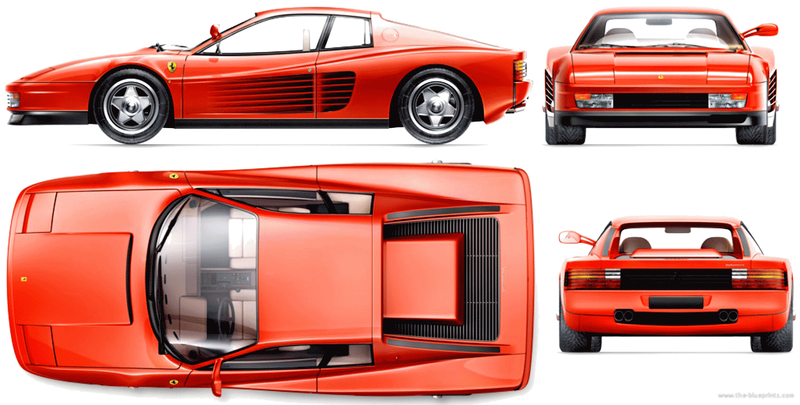 The later editions of the Testarossa were all equipped with two standard side mirrors. 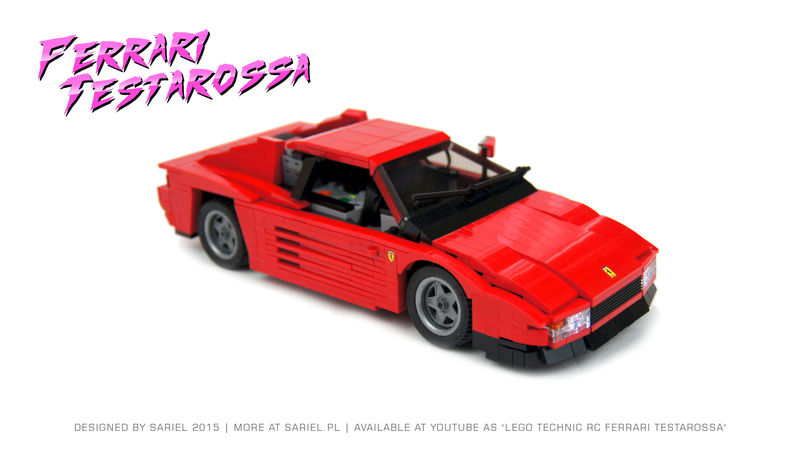 They were also restyled and modified, and they completely lacked the rough 80’s charm of the original Ferrari Testarossa. Note: the video is best viewed from VHS while combing your mullet. 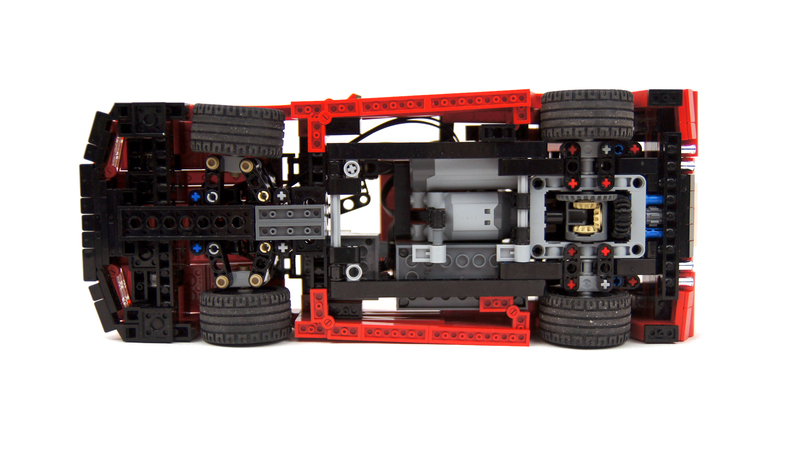 Update: instructions for the steering system are now available in the Downloads section. 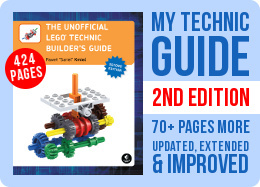 first of all: your book “the unofficial Lego technic builders guide” is my LEGO technic bible. Really great. 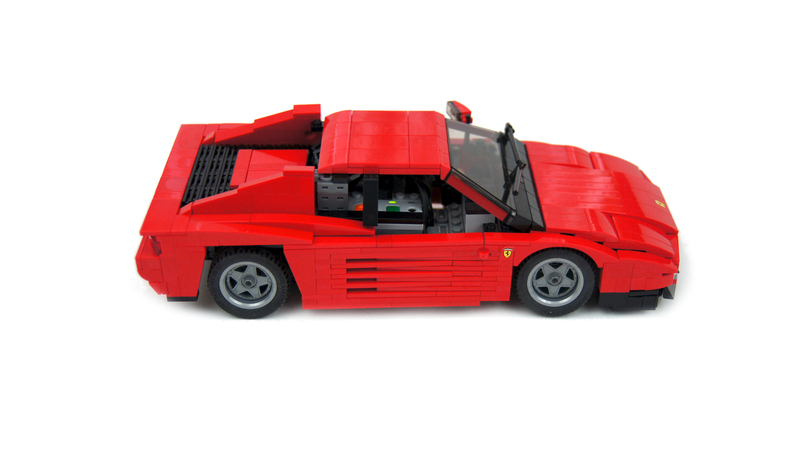 I just tried to motorize the F40. I took a L-Motor and a 24/8 transmission (no differential, not nessesary with this width), a Servo for steering. 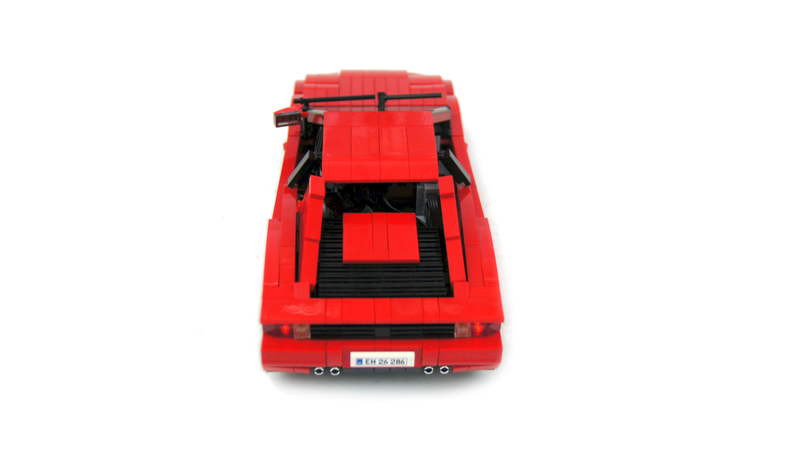 It really required rebuilding the entire chassis from a scratch… I changed everything except the doors. I’m glad, but I still don’t have instructions. Not really. I’m pretty inexperienced. I build from instructions to get the technique. I took it apart already. But come on, it’s so small and simple, I’m sure you can build it from the photos. No, I mean instructions for the whole thing. Yeah, I’ve made instructions for the steering system available. It does not look crappy! Could you please make some instructions available? It’s just some free YouTube music. this is the last post about this subject. I don’t know, that depends on what you need. 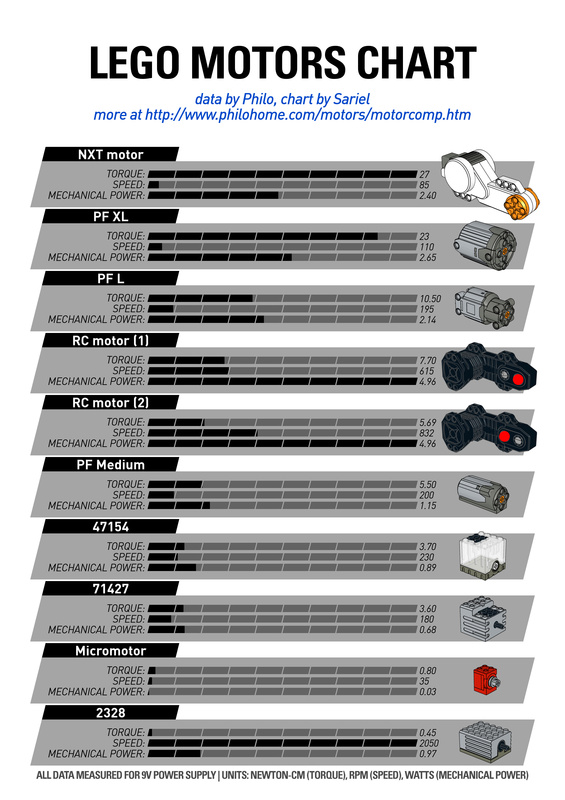 Lego has equivalents of both variants, and both are useful. Hello and sorry for contacting this way. for diff and diff lock, my question is this: should I make it one end open or make it 7×9? That game is the classic Outrun and that model should be ready inside a month from now. I did – for the steering system, which is the only complex part. The rest is dead simple and you should be able to build it from the photos. Just be creative. Can you publish the instructions, please ?